With increased interests in social investment  and diverse players, necessity for social monitoring and evaluation methods are also increasing. For the second part of the series, I will introduce different types of social evaluation methods that are available worldwide. is an investment that pursues not only economical return but also social return. It is sometimes possible that social return is achieved with some degree of sacrifice of economic gain. is conceived from the doubts about investments that produce enormous profit in a short period of time, and is based on the the idea that a business that produces social value can sustain economic profit in the long run. invests, specifically, in companies that conduct their businesses with the aim of contributing to social problem solving, such as poverty, environment and social welfare. 2) positively evaluate social changes among involved individuals, in addition to the company’s economical activities. 3) in comparison with typical investment, long-term return is more important than the short-term return. Institutions that perform investment must have policies of investment. For example, institutions that claim to perform social investment (including ARUN), have evaluation standards that reflect the values described above, and policy to use for investment decision-making. You may hear often the expression in the context of social investment and impact investment; “(social) impact-first or finance-first.” Investors decide the weight of social return versus economical return, but actually, social and economical concepts are not in the opposite poles, but rather, change according to the mission and investment policies as follows: impact-first~mostly impact~blend(value)~mostly finance~finance-first. In short, the term “social investment” encompases various philosophies and investment methods. Such philosophy (guidelines, principle, policy) governs the daily investment projects and management support, but the important issue in social investment is how much social impact investment can produce. In order to evaluate this, investment impact must be measurable objectively and quantitatively. Answering the question: “what is the social impact achieved by the investment (input)?” Many institutions that perform social investment develop and introduce appropriate evaluation methods to perform monitoring and evaluation. They also publish periodical reports to achieve information transparency, which also helps to prevent subjective self-satisfaction of the investors and managers. Measuring and evaluating social impact of the investment objectively and quantitatively, reliability of the investment scheme will increase, and in return, contributes to the expansion and development of the investment. Below is a chart of some of the social and development impact evaluation frameworks and indicators that are currently used in social investment and impact investment, especially focused on business. Guidelines for creating sustainability report (CSR report, etc.). 4th edition published in 2013. Focused on activity output, users can select necessary topic from over 400 topics. Indicator for the impact on the social, environmental, and labor; impact on products and services of organization, finance, and the company activities. Applicable to various methods and frameworks, designed to meet the needs to the uniformity and comparison. Actual usage examples are shared on the website. Scheduled to publish version 3.0 in 2014. As a rating organization that evaluates social impact of the invested businesses, it is supported by 20 foundations and investment banks and 43 funds, such as ADB, IDB, Rockefeller Fund. By 2012, 416 companies, 60 funds have been evaluated and reported. Companies participating in BCtA provide frameworks to monitor development effects of inclusive business. Indicator for investment, employment, human resources, business development, income increase, finance and service access, infrastructure and sustainability. Companies publish the prediction of development effects before the project starts in the application form. Following years, every year, they self-assess the actual effects in the Results Form. A framework to evaluate the development effects of finance, economy, environment and society, private sector of all projects that IFC supports. It enables to compare projects and companies horizontally. There is a general indicator and industry-specific indicator. Based on the reports that companies submit, IFC performs the evaluation. Not only evaluating developmental effects, it also aims to improve the effects, and it is used for decision making and evaluation of business strategies. A framework to evaluate development impacts of businesses. In order to correspond to internal motivation of the companies, it is developed to monitor business risks and opportunities, focusing on result chain and selection of indicators. It is expected that the companies themselves set the scope of evaluation and analyze direct and indirect impacts and developmental effects, and use the results for management decision making. It focuses more on the process rather than specific indicators, but evaluates from the points of business management, environment management, contribution to infrastructure, finance and services, employment and technical development, use of local products and local taxation. A framework to evaluate development impact of businesses. Measures impacts and outcome of each stage of value chain. There is no specific indicator, but especially in the field of value chain, macroeconomics, regulations and policies, environment, product development and marketing, it analyzes the contribution to living standards of the poor, health, gender, empowerment. Inclusive. In order to perform evaluation, it requires a lot of time and human costs. As a result, in the past 10 years since its development, only four companies used this method. A framework to display two separate scenarios of impact: 1) the prospective inclusive business targets poverty population as consumers; and 2) the prospective inclusive business targets poverty population as producers and distributors. Evaluation from the point of finance, development and environment. There are sample indicators, but companies can report freely. Clarifies social values resulting from a business for each stakeholder, and by calculating the value as monetary value, expresses the business value quantitatively. It is not a method for business evaluation, but aims to actualize innovation by using the analytic process and results for business improvements. It was developed by Grameen Foundation, which was established to develop Grameen Bank’s finance model. Its aim is to gain the fundamental knowledge of the poverty population before providing finance projects. It is used to compare the status of poverty population before and after the microfinance projects. It consists of 10 indexes (non-financial indexes) for each country. It is used by microfinance institutions to analyze data regarding poverty population (mainly data needed for calculating poverty population) for strategic decision making. From Pages 6-16, 6-17 modified and added. 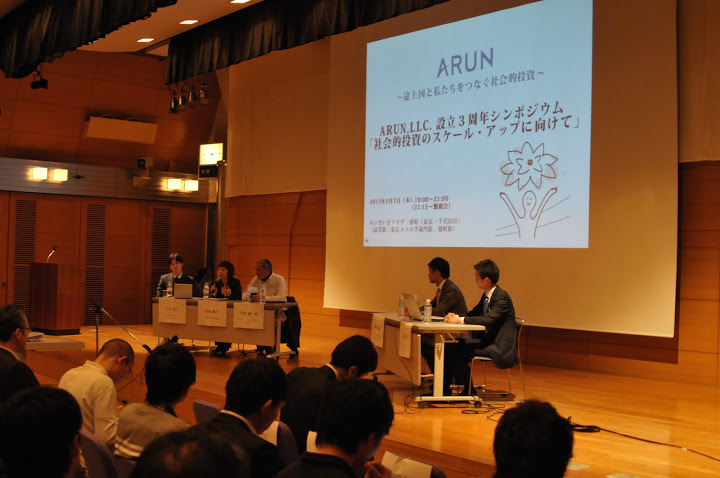 ARUN has developed our own social evaluation framework in 2012, based on research on the above mentioned existing social evaluation methods and in accordance with our mission and investment policies, and is undergoing reviews and reporting of our current investment funds. In 2014, we are planning to carry on practical and innovative projects, including corroboration with Impact Reporting and Investment Standards (IRIS) which is trying to establish international standards worldwide. In this series, we define “social investment” as flow of money that is sensitive to social impact, and the creation of the flow by investment activities. Similar words include; SRI = Socially Responsible Investment, sustainable & responsible investment, sustainable investment, impact investment, investment with blended value, etc. Each word’s specific definition varies, but all include the concept of investment activities that is sensitive to social impact, environment and corporate governance.